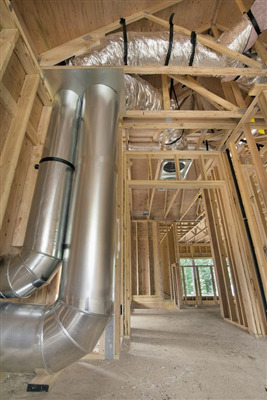 Your home’s duct system is often easily overlooked but vital to the health and safety of your home. Your ducts are your home’s respiratory system, and keeping them healthy is one of the simplest, most important things you can do for your family’s overall safety and well-being. Because your home’s duct system is so important, diagnosing problems is a crucial step in keeping your home safe. Dust Doctors in Minnesota offers a complete diagnosis and HVAC duct cleaning to get your ducts in top shape. When we think of fresh, cool air, it is easy to forget that air carries plenty of particles. Typically, these particles become caught in your HVAC system’s filter system. Unfortunately, sometimes these particles can make it past the filter. When this happens, your home’s duct system can become dirty. Additionally, plenty of other unwanted materials can make it into your ductwork. Mold and mildew are facts of life in all buildings and homes. If the weather or your home has been humid, this is especially true. It is only when they reproduce that they become a problem. Mold can get into your duct system when the airflow becomes slowed or clogged. The Environmental Protection Agency recommends routinely checking your home’s ducts for mold and mildew. We evaluate your system for condensation and clear out any problems before they can make you sick. Microorganisms in your ductwork can lead to serious health complications. A great number of these microbes are airborne. Dust mites are rampant within dirty duct systems, feeding off organic materials found within the dust that resides there. Disease-causing organisms can also come to rest and reproduce within a dirty duct system. Pet hair can build up within your air duct system. Pet dander is a gourmet dish to the common dust mite. If you see pet hair built up anywhere around your ducts, it is a pretty safe bet your ducts are full of it. Besides pet hair and mold, there are a number of other allergens that can come to build up in your air ducts. Pollen and other allergens can make its way into your ducts and add to your asthma and allergy problems. If you have struggled with insect or rodent infestations, chances are very high your unwanted guests made it into your HVAC system. We offer air duct pest control cleaning to get your ducts clear of stowaways. Dust in your ducts can get into your HVAC system’s motors, gears, and other components and quite literally gum up the works. Our professional duct cleaning system can clear your ducts and get the fresh air blowing again. Dust Doctors in Little Canada can help keep your home’s duct system healthy. Our team believes in providing you with a clean home and excellent duct and vent cleaning service for a reasonable price. We use a custom package of tools including high-powered blowers, truck-mounted vacuum units, and pneumatic brushes to get your ducts in top shape and keep your home healthy. For more information, call us at 651-319-9777, or you can message us on our contact page. « Whole-Home Air Purifier Vs. Portable Air Purifier: Which is Best?